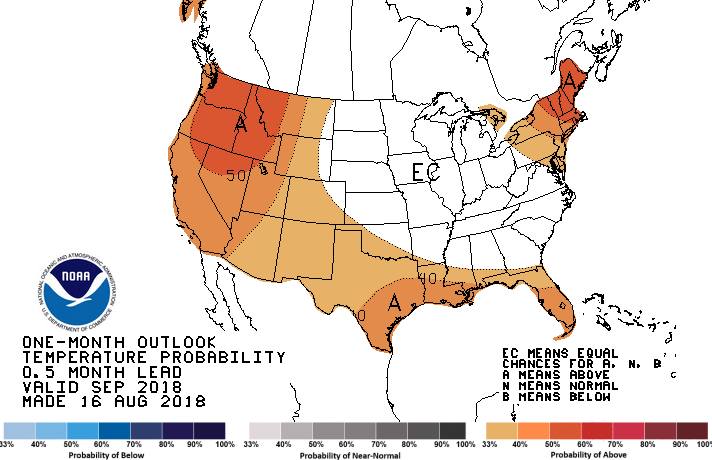 NOAA’s September Outlook – Warmth and Wetter: The new 30 day outlook has been issued for September from NOAA’s Climate Prediction Center. More than half of the country is expected to see warmer than average weather, including the Northeast, the southern tier of the nation, and the West. Temperatures are expected to be near averages from the Mid Atlantic to the Northern Plains. Wetter than normal weather is expected along the East Coast and in the Southwest. Drier than average precipitation is forecast for the Gulf Coast and in the Pacific Northwest. El Nino is expected to develop later this year, as shown in the autumn outlook released on Thursday, but it is not a factor at this time. Current atmospheric trends and model guidance were the main influences on the September outlook.